Esophageal Reconstruction Using Biological Scaffolds in a Clinical Setting. Introduction: Extracellular matrix (ECM) scaffolds have been shown to be effective for reconstruction of esophageal tissue in pre-clinical models. The remodeled tissue showed mature epithelialization, a distinct submucosal layer characterized by dense, organized collagenous tissue, and an organized, appropriately oriented skeletal muscle layer that was integrated into the adjacent normal muscle tissue. Herein, we describe three cases of esophageal reconstruction using ECM. Case 1: A 65 year-old male presented with Barrett’s esophagus with extensive high-grade dysplasia and intramucosal adenocarcinoma. Due to his comorbidities, an 8cm long, circumferential mucosal resection was performed by submucosal dissection. The resected area was covered with ECM held in place with a self-expanding endolumenal metal stent. Two weeks later, the stent was removed and ECM could be seen attached to the resected area. At three months, the resected area was completely covered with normal appearing epithelium and there was a smooth circumferential stricture of 5 mm in length, which required dilation at the time of surveillance endoscopy (X2). At five months the esophageal lumen appeared widely patent over the resected area without evidence of scarring or stricture. The patient is now disease free and can tolerate a normal diet. Biopsies over the healed site of resection revealed squamous epithelium. Case 2: A 69 year-old male with a history of hypopharyngeal carcinoma presented with complete occlusion of cervical esophagus secondary to chemoradiation. Patency in this stricture was achieved using an endoscopic rendezvous technique. After several dilations of increasing diameter, a pinpoint fistula developed between esophagus and irradiated skin. A continuous leak of saliva was observed through this fistula, located 2 cm below the proximal end of 5 cm long stricture. The total length of stricture was covered with ECM held in place with a covered metal bronchial stent after determining stricture diameter with a sizing balloon. Immediately after this procedure, the leak stopped and he can now consume a full liquid diet. Case 3: An 8 year-old boy with a previous history of caustic ingestion presented with esophageal stricture. After repeated dilations, he underwent an esophageal replacement with a colonic conduit that developed segmental stricture at two different levels due to ischemia of the conduit. One stricuture, located at the level of the esophagocolostomy, could not be resolved with two subsequent conventional surgical procedures. 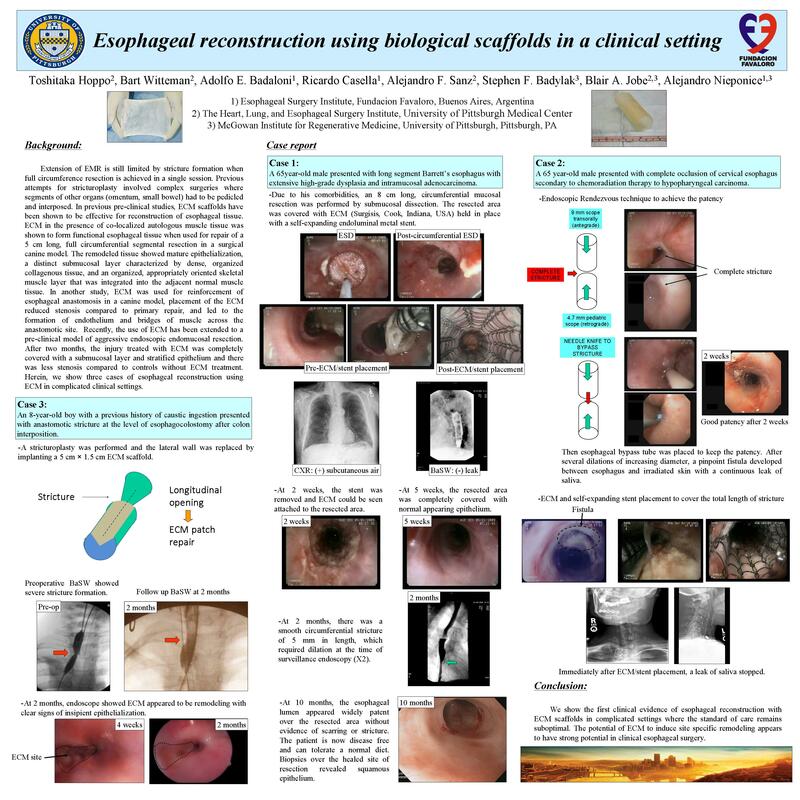 In order to provide definitive treatment, an esophageal reconstruction was attempted by performing a stricturoplasty, whereby the esophagus was opened longitudinally along the stricture and the lateral wall was replaced by implanting a 5 cm × 1.5 cm ECM scaffold. At seven days, oral intake was reinstated. At one month, endoscopic exam showed no stricture and the ECM appeared to be remodeling with clear signs of insipient epithelialization. At two months, barium swallow showed no stricture formation. Conclusion: We describe the first clinical evidence of esophageal reconstruction with ECM scaffolds in complicated settings where the standard of care remains suboptimal. The potential of ECM to induce site specific remodeling appears to have strong potential in clinical esophageal surgery.